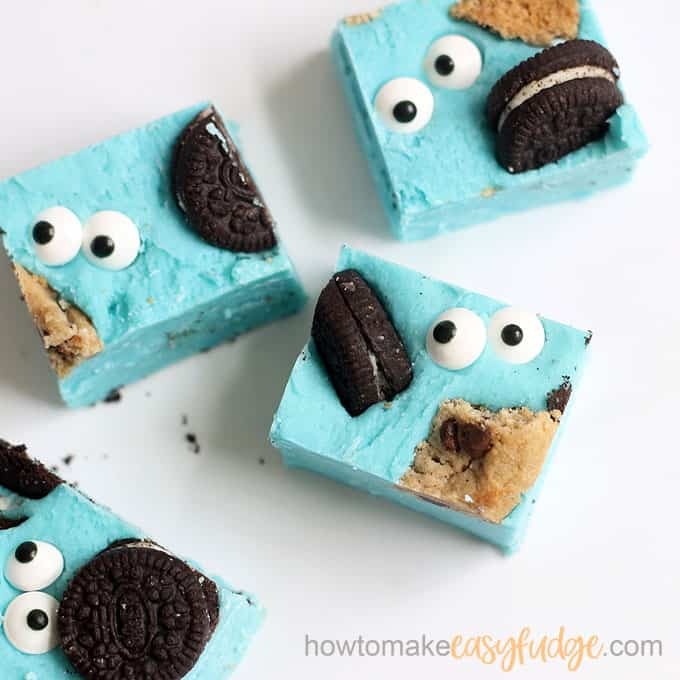 COOKIE MONSTER FUDGE: Fun, blue fudge for a Sesame Street party. 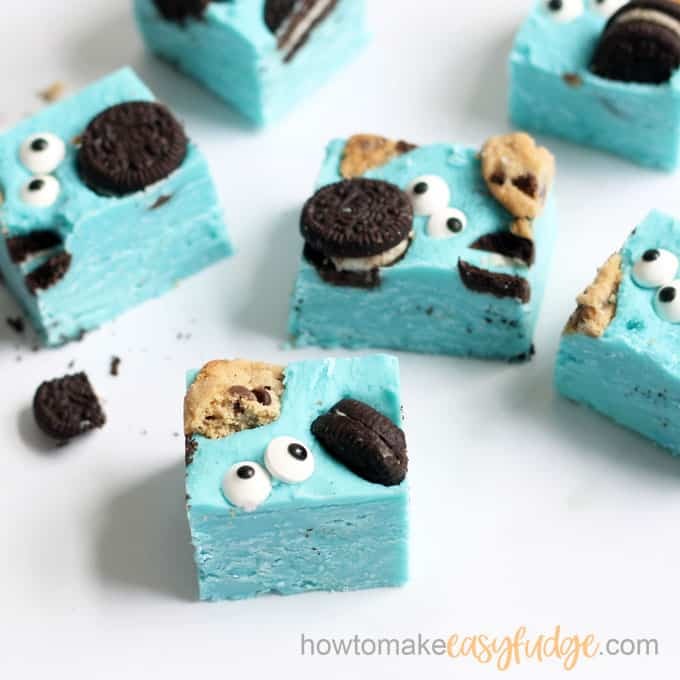 This fun Cookie Monster fudge is easy to make and a perfect treat for a Sesame Street party. Or just whip some up for your favorite Cookie Monster fan. 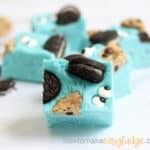 Cookie Monster Fudge is so easy to make. 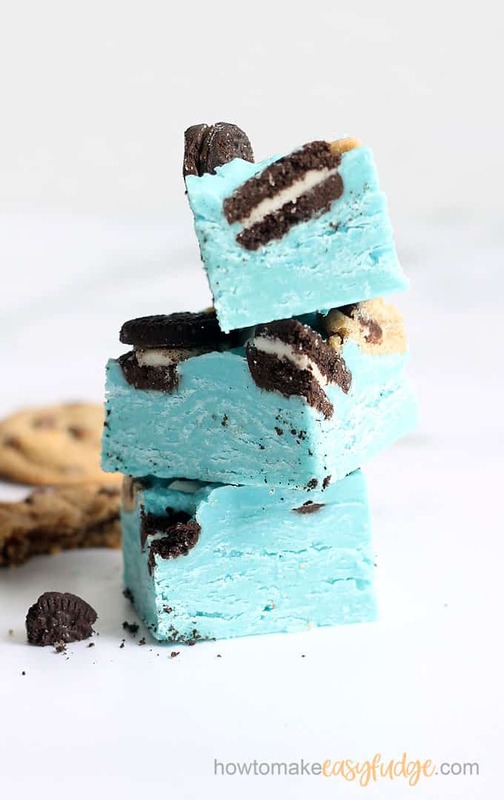 This recipe takes our easy fudge recipe that combines melted chocolate with a can of sweetened condensed milk to create the perfect fudge (without the need for a candy thermometer), but instead uses blue candy melts. 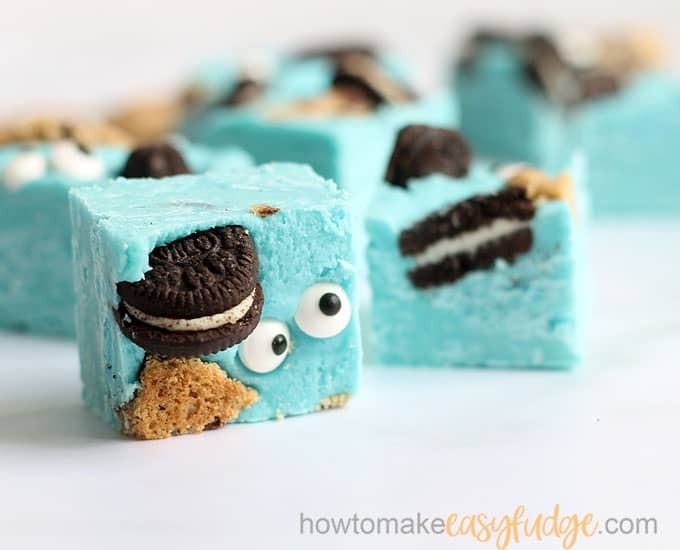 Top with cookies and candy eyes so your fudge has the likeness of the famous Cookie Monster. I’m a longtime fan of Jim Henson and all of his Muppets (Who isn’t? Remember The Fraggles?). Check out these easy Cookie Monster donuts, too. And if you’re hosting a kid’s birthday party, here are 25 Sesame Street food ideas for you. 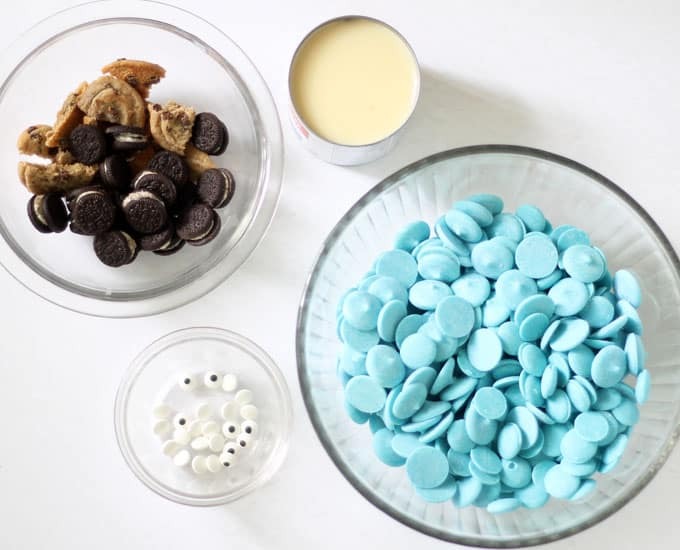 In a microwave-safe bowl, place 24 ounces of blue candy melts. (This is TWO bags of candy melts, or about 4 cups total). Microwave at 70 percent power for 90 seconds. Stir well, using the residual heat to completely melt the candy melts. If necessary, continue to microwave at 15 second intervals. Stir until the candy is very smooth. Alternatively, if you prefer to melt the candy melts on the stove-top, set a heat safe bowl on top of a sauce pan of simmering water, making sure the water doesn’t touch the bottom of the bowl. Stir until melted. Once your candy is melted, stir in one 14-ounce can of sweetened condensed milk. Pour the mixture into the prepared pan and spread evenly. Top with broken chocolate chip cookies and mini Oreos, pressing gently into the fudge. Add pairs of candy eyes. I used about 1 cup total of a mixture of Entennmann’s mini chocolate chip cookies (halved or quartered) and mini Oreos. I used about 1 tablespoon of the candy eyes. Refrigerate the fudge for 2 hours to fully set and carefully cut into squares. Candy melts, also known as confectionery coating or melting candy), are chocolate-like products that use palm kernel oil, or other vegetable oils, for cocoa butter, making it easier to work with in candy making. It melts easily at lower temperatures than chocolate, and it hardens more quickly. The flavor is good but not quite and rich as pure chocolate, but if you enjoy eating it right out of the package you will like it in a homemade fudge recipe. 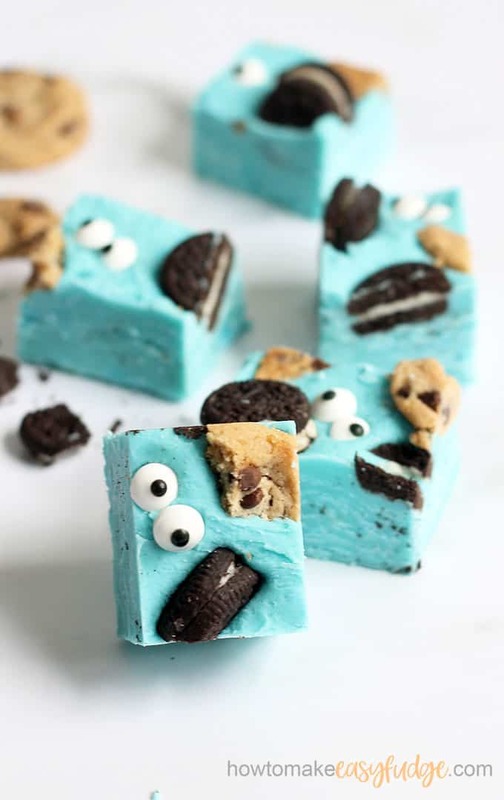 This fun, blue, cookie-filled Cookie Monster fudge is perfect for a Sesame Street party. Line an 8-inch square baking pan with lightly greased parchment paper or non-stick foil. Set aside. In a microwave-safe bowl, place the candy melts. Heat at 70 percent power for 90 seconds. Stir well, using the residual heat to slowly melt the candy melts. If needed, microwave for additional 15 second increments and stir until the candy is completely smooth. Stir in the sweetened condensed milk. Pour the mixture evenly in the prepared pan. Top with cookies and candy eyes, pressing into the fudge. Chill to set the fudge about 2 hours. Cut into squares. 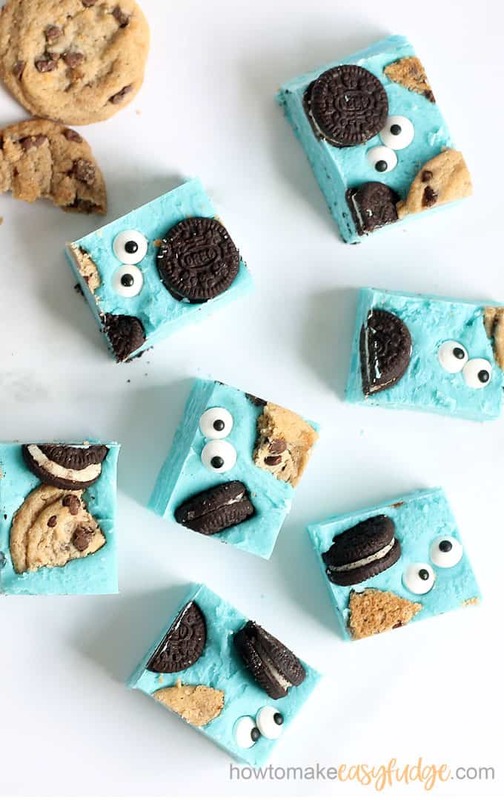 If you found this Cookie Monster fudge searching for all things Cookie Monster, here are a few more Cookie Monster food ideas. These Cookie Monster pretzels are my favorites. I love these Cookie Monster freak shakes. Try some easy Cooke Monster chocolate bark. Or these Cookie Monster Oreos. 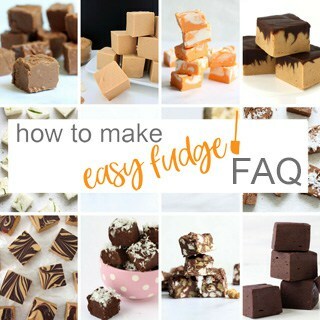 Need more ideas for fun fudge recipes? 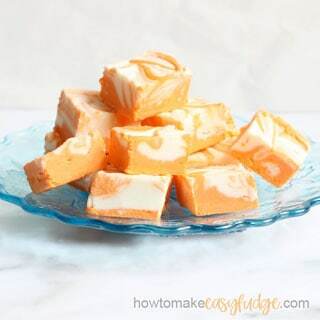 Check out these easy homemade fudge ideas. 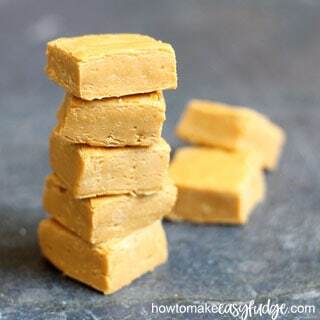 Butterbeer fudge for the Harry Potter fan. 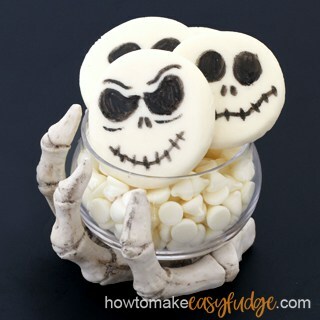 Jack Skellington fudge for Halloween. These are so much fun. The kids will love them. 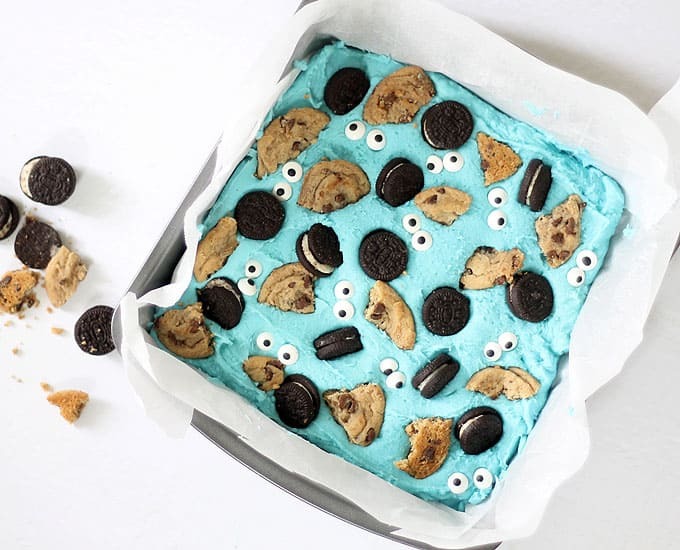 This is the cutest Cookie Monster Fudge ever! Hello, This is a great recipe, thank you for sharing it with us for the thorough blog post. My family loved this fudge. This is the cutest darn fudge I’ve ever seen. This fudge is so cute. Nom, nom, nom! This is so cute. I made it for the kids I babysit for and they couldn’t stop laughing. They had so much fun making Cookie Monster noises! Oh, my goodness this is so much fun!